1966 Ford Mustang, 200 CID, restored in 2003. Numbers matching. I've owned this car since 2002. Looks just as good now as when it was restored. Garaged since it was restored. Only driven in good weather. Manual steering, manual brakes, 3-speed manual transmission. Custom color "Candy Apple Red". 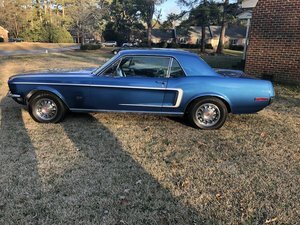 New quarter panels, new valance, new bumpers, new chrome, new pony interior, new steering wheel, rebuilt engine, new ball joints, new top motor. Lots of fun to drive and tons of compliments!